Company with a tradition since 1920. The company “Poličské strojírny a.s.” has an implemented, maintained and documented Integrated Quality Management System meeting the requirements of EN ISO 9001:2015, EN ISO 14001:2015, AQAP 2110 (ČOS 051622), and BS OHSAS 18001:2007 standards, which includes all products and processes ensured by the company. The IATF 16949:2016 standard has been introduced for the development and production of pneumatic elements. The firm purposefully controls and continually improves all processes affecting customer satisfaction. 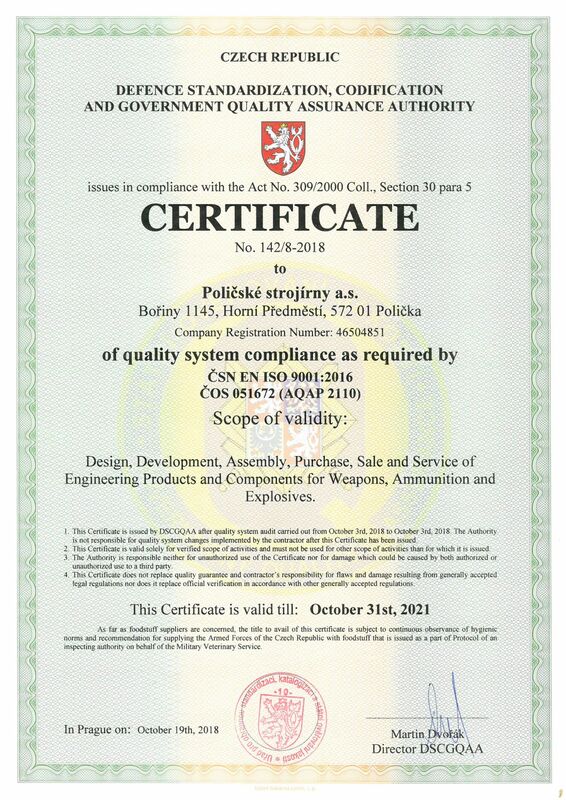 Rok 2016 Customer audit by Úř OSK SOJ (Defence Standardization, Catalogization and Government Quality Assurance Authority) in Prague, the Certificate of Conformity of the Management System with the requirements of ISO 9001:2008 and ČOS 051622(AQAP 2110) standards was issued. Recertification of the system. Rok 2017 First surveillance audit by Úř OSK SOJ in Prague, the Certificate of Conformity of the Management System with the requirements of ISO 9001:2008 and ČOS 051622(AQAP 2110) standards was issued. Change in the extent of validity. 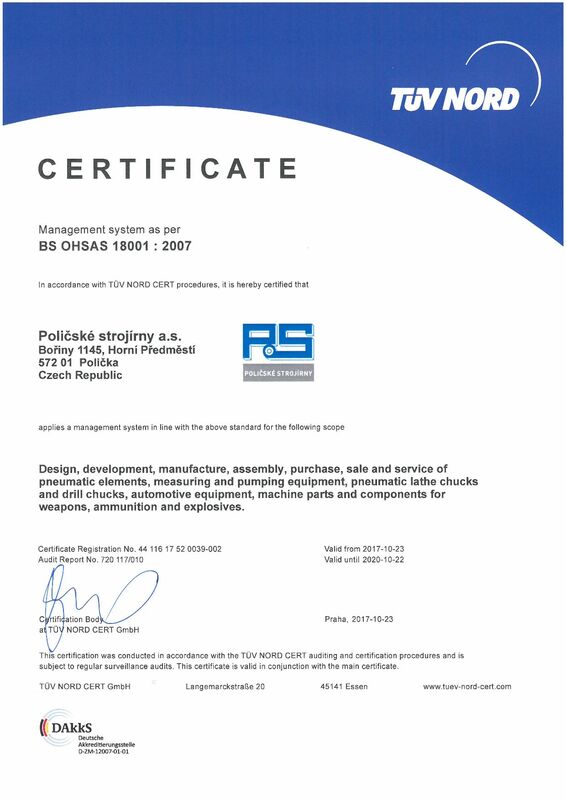 The certificate was issued in connection to organisational changes. 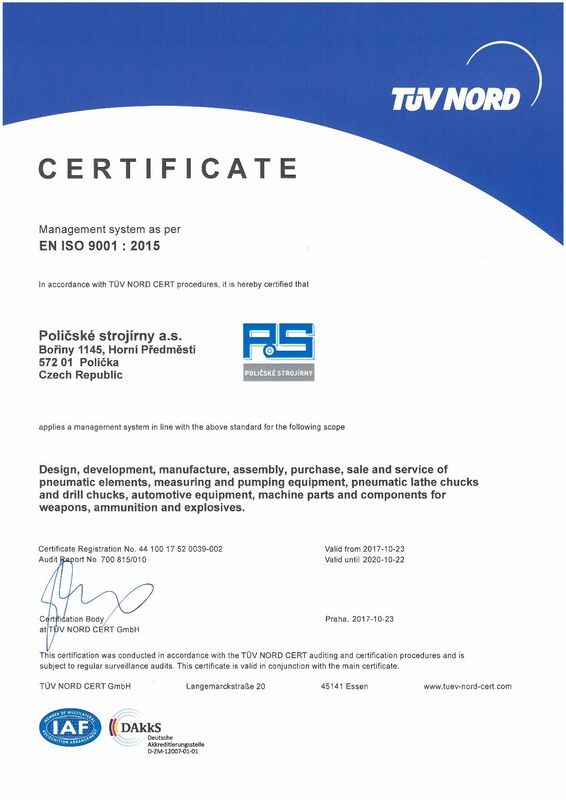 Recertification of the system according to EN ISO 9001:2015, EN ISO 14001:2014, BS OHSAS 18001:2007. 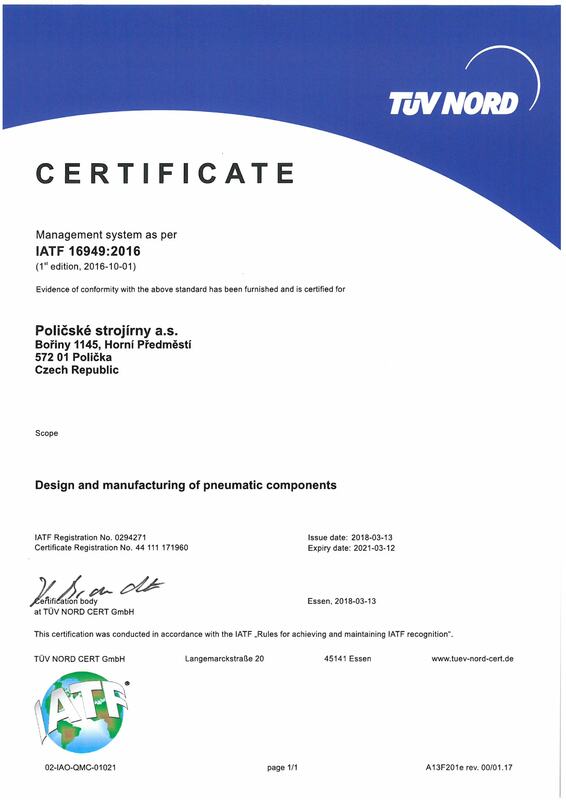 Certification of Quality Management System according to IATF 16949:2016 standard. 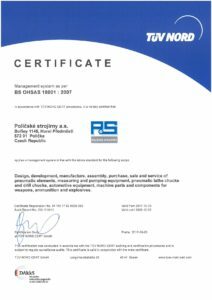 Poličské strojírny a.s. is committed to communicate its environment protection policy to the public openly.